Are you looking forward to working on a controlled demolition project? If that’s true, you must choose the right technique to accomplish your project within deadlines without increasing the cost. Hydraulic bursting is one of the most effective controlled demolition techniques that demolition contractors use to bring down all sorts of buildings and structures. Whether you talk about a concrete building or a masonry structure, you can bring it down with hydraulic bursting in the safest way possible. 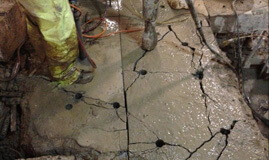 While executing a hydraulic bursting project, demolition experts drill several holes on concrete/masonry structure. They then add burster head in each of these holes and use hydraulic power to expand them. When these burster heads start expanding, they begin to create cracks on the structure, which eventually help in separating the large chunks of concrete or masonry safely from the structure in question. Cracks begin to occur on the structure between the drilled holes because that part becomes a bit weak. And the best part is that demolition experts face no risk of injuries when they carry out a demolition project with the help of hydraulic bursting technique. Hydraulic bursting is not only safe, but it’s also a highly efficient demolition technique. When compared to other methods, it can help you demolish a building and a structure quite fast. Demolition experts use diamond drill bits to create holes quickly, and once they insert burster heads in these holes, they start expanding fast causing cracks in the concrete structure. Finally, demolition experts use quality tools to remove concrete chunks quickly and safely. Demolishing a large structure used to be utterly difficult before the introduction of hydraulic bursting, but today it’s quite simple. Demolition techniques that contractors used to use earlier involved a lot of manual work which was not only dangerous for the integrity of the structure but also for the health of the workers. Injuries among demolition professionals were far too common when compared to today’s time. And the worst part was that those techniques demanded a lot of physical efforts which used to make the demolition professionals tired. In other words, the process of demolition used to be utterly tiresome and challenging earlier. When compared to other demolition techniques, hydraulic bursting is noise-free. It is true that in the beginning when demolition experts drill holes in the structure with the help of diamond drill bits, it cause a bit of noise, but the rest of the activities that they perform are noise-free. Since it produces minimal noise, it remains one of the first choices of demolition contractors and building owners when it comes to demolishing a structure. It’s especially helpful for busy places such as hospitals, schools, colleges, and offices, etc. While demolishing a structure with a hydraulic bursting technique, the structure vibrates only during the drilling process; otherwise, the rest of the process is vibration-free, which helps in maintaining structural integrity. Demolition projects involve the production of a lot of dust and noise which is very dangerous for the health of the workers, but using hydraulic bursting solves this problem. Because of the non-percussive nature of hydraulic bursting, it produces no dust, which eventually eliminates the risk of health problems faced by workers. Apart from that, hydraulic bursting is an ideal technique for confined spaces, and it’s also not that expensive.